Wheel alignment is important to the health of your car or truck. If you hit a massive pothole, you might bump your suspension out of the carefully calculated locations that the components have been set. All of the elements that make your car go straight are called “alignment.” Some shops try to make it seem like rocket science, but wheel alignment is a fairly straightforward affair. The inclusive term “wheel alignment” involves three main measurements — caster, camber, and toe. 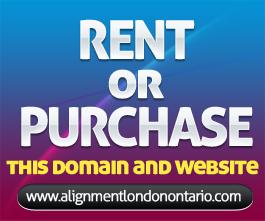 These measurements have standards that a technician uses as targets of adjustment. In other words, get as close as you can to the right measurement. The good news is that most modern cars only have adjustments for toe. Caster and camber went the way of the dodo thanks to the McPherson strut. Caster is the tilting of the uppermost point of the steering axis either forward or backward (when viewed from the side of the vehicle). A backward tilt is positive (+) and a forward tilt is negative (-). Caster influences directional control of the steering but does not affect the tire wear and is not adjustable on this vehicle. Caster is affected by the vehicle height, therefore it is important to keep the body at its designed height. Overloading the vehicle or a weak or sagging rear spring will affect caster. When the rear of the vehicle is lower than its designated trim height, the front suspension moves to a more positive caster. If the rear of the vehicle is higher than its designated trim height, the front suspension moves to a less positive caster. With too little positive caster, steering may be touchy at high speed and wheel returnability may be diminished when coming out of a turn. 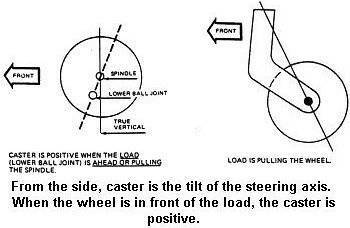 If one wheel has more positive caster than the other, that wheel will pull toward the center of the vehicle. This condition will cause the vehicle to pull or lead to the side with the least amount of positive caster. 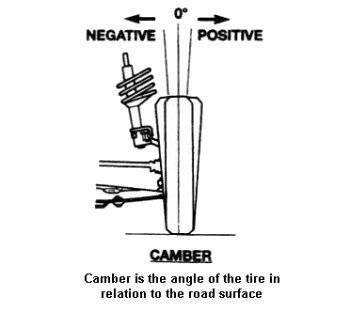 Camber is the tilting of the wheels from the vertical when viewed from the front of the vehicle. When the wheels tilt outward at the top, the camber is positive (+). When the wheel tilts inward at the top, the camber is negative (-). The amount of tilt is measured in degrees from the vertical. Camber settings influence the directional control and the tire wear. Too much positive camber will result in premature wear on the outside of the tire and cause excessive wear on the suspension parts. Too much negative camber will result in premature wear on the inside of the tire and cause excessive wear on the suspension parts. Unequal side-to-side camber of 1° or more will cause the vehicle to pull or lead to the side with the most positive camber. The angle between the thrust line and centerline. If the thrust line is to the right of the centerline, the angle is said to be positive. If the thrust line is to the left of center, the angle is negative. It is caused by rear wheel or axle misalignment and causes the steering to pull or lead to one side or the other. It is the primary cause of an off-center or crooked steering wheel. Correcting rear axle or toe alignment is necessary to eliminate the thrust angle. If that is not possible, using the thrust angle as a reference line for aligning front toe can restore center steering. The sum of the camber and SAI angles in a front suspension. This angle is measured indirectly and is used primarily to diagnose bent suspension parts such as spindles and struts. The angle formed by a line that runs through the upper and lower steering pivots with respect to vertical. On a SLA suspension, the line runs through the upper and lower ball joints. On a MacPherson strut suspension, the line runs through the lower ball joint and upper strut mount or bearing plate. Viewed from the front, SAI is also the inward tilt of the steering axis. Like caster, it provides directional stability. But it also reduces steering effort by reducing the scrub radius. SAI is a built-in nonadjustable angle and is used with camber and the included angle to diagnose bent spindles, struts and mislocated cross members. Kingpin offset is the distance from the center of the wheel contact face to the intersection point of the kingpin extension. The line through the center point of the spring strut support bearing and the control arm ball joint corresponds to the “kingpin”. The scrub radius is influenced by camber, kingpin angle and wheel offset of the wheel rim. This is set at the factory and is not adjustable. Set back is the amount by which one front wheel is further back from the front of the vehicle than the other. It is also the angle formed by a line perpendicular to the axle centerline with respect to the vehicle’s centerline. If the left wheel is further back than the right, setback is negative. If the right wheel is further back than the left, setback is positive. Setback should usually be zero to less than half a degree, but some vehicles have asymmetrical suspensions by design. Setback is measured with both wheels straight ahead, and is used as a diagnostic angle along with caster to identify chassis misalignment or collision damage. The presence of setback can also cause differences in toe-out on turn angle readings side-to-side. Ride height is the distance between a specified point on the chassis, suspension or body and the ground. Measuring ride height is an indirect method of determining spring height, which is important because it affects camber, caster and toe. Low ride height indicates weak or sagging springs. Ride height should be within specifications before the wheels are aligned.